Country KVET-FM, continues to skyrock upward 1.8-2.0-3.1-5.9, the showing is good for #4 6+. That vaults KVET-FM into fourth place with its prettiest PPM share ever. 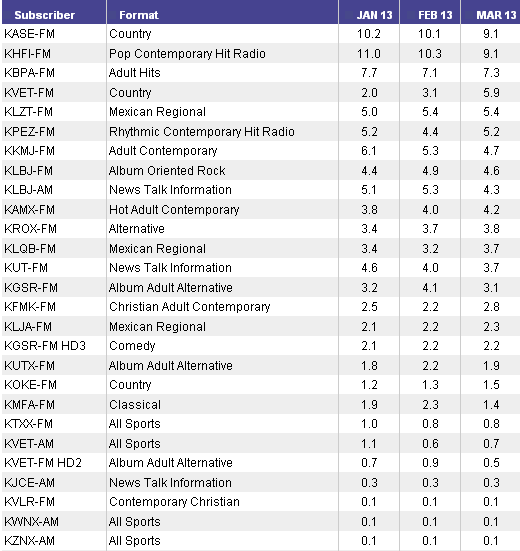 KVET-FM and country sibling KASE, Clear Channel’s country share in Austin now at 15.0 share of age 6+ AQH listening. Arbitron March PPMs were released Thursday for Austin, Milwaukee, Indianapolis, Raleigh, Norfolk, Nashville, Memphis and Hartford. Click Here.